September 27th, 2016 By: GGT Category: 2017/07 release, Figure News. Max Factory is going to release the Shidare Hotaru ( 枝垂ほたる ) 1/8 PVC figure from the manga/anime “Dagashi Kashi” ( だがしかし ). Will be released in July 2017. Around 215mm tall, 12,778 yen. The candy-loving beauty with a bit of an unfortunate personality! 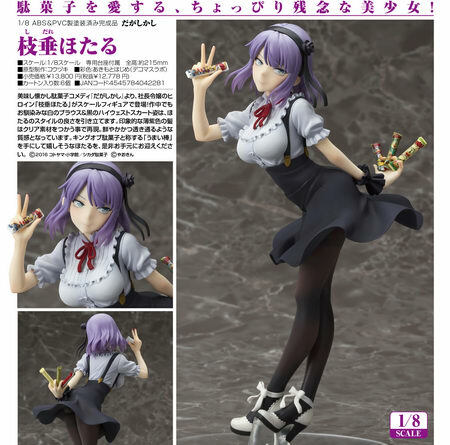 From the comedy series all about delicious Japanese sweets, ‘Dagashi Kashi’ comes a 1/8th scale figure of the daughter of candy company’s president – Shidare Hotaru! She has been sculpted wearing her standard white blouse and black high-waist skirt from the series which brings out her impressive figure for fans to enjoy! Her striking purple hair makes use of translucent ends which faithfully capture the vivid yet almost see-though appearance and texture of her hair. She holds a number of Umaibo – the so-called ‘King of Cheap Sweets’ – in her hands with a huge smile on her face, ready to be added to your figure collection!